The Thai delegation from Srithammaratsuksa School expressed interest in sending students and teachers for the Holiday English Camp in WOU, following a study visit to the main campus today.. The delegation arriving at the main campus. WOU hosted the visitors, comprising 39 teachers and four administrators, who wanted to learn about the Malaysian university system and curriculum. The delegation was led by Saengjan Mitrakul, Director of the school, and Juthaporn Taokham, Assistant Director of Academic Affairs and Educational Quality Development of the school’s English Programme. The visitors pose with the University staff. They were briefed about WOU’s academic programmes, course delivery and learning support, particularly the University’s learning management system (LMS), WawasanLearn, by School of Education, Languages & Communications (SELC) lecturers Sean Ooi Li Hsien and Arathai Din Eak. Ooi shared about the various programme disciplines, how tutorial classes are conducted, and the 24/7 digital access granted to students to the main library. He assured that all WOU programmes are recognised by the Malaysian Ministry of Education. Ooi shares about the University and its programmes. Arathai meanwhile talked at length on the learning management system that keeps students connected to the University and their studies. She also highlighted the single course registration and the Holiday English Class, which piqued the interest of the delegation. She added that WOU, through the Centre for Professional Development & Continuing Education (PACE), had recently organised a 10-day English language workshop for Silpakorn University undergraduates. She mentioned other training workshops conducted by SELC academics, namely English for Working Professionals, Innovative Pedagogy for Teachers, Research Methodology, and Effective Supervisor Training. 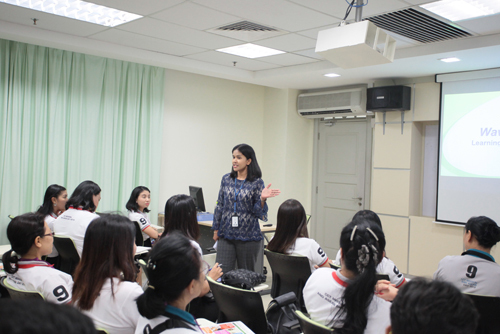 Arathai explains about the University's learning management system. Many questions were raised by the delegation, including on tutorials, assignment submissions and WOU’s graduation rate. To a query on students’ accessibility to the LMS, Ooi explained that this online platform is available throughout the semester until the final exam, and that they use data analytics to gauge which students had never logged in and consequently follow-up with calls. Juthaporn said the school would probably want to collaborate on the English classes and asked for details on the fees, duration, and such. “How can we possibly work together as we need to improve the English of our teachers and our students? I can see you are flexible. We can plan together.” She aimed to tie up with WOU on the training of their students and Thai teachers in English next year. Juthaporn (2nd from right) expresses interest in the Holiday English classes. The delegation was further informed that WOU provides experiential learning field trips to destinations like the Batik Factory and heritage sites to expose them to the local culture, as part of the class. Prof Santhiram delivers his closing remarks. Srithammaratsuksa School is a private Christian co-educational institution in Nakon Si Thammarat, Thailand, with 5,200 students from nursery to upper secondary (Grade 12).